Seymour Stern concentrates his practice in three distinct and interrelated areas: business transactions, estate planning and administration and real estate transactions and land use. He has particular experience counseling entrepreneurs from start-up to transfer or sale. 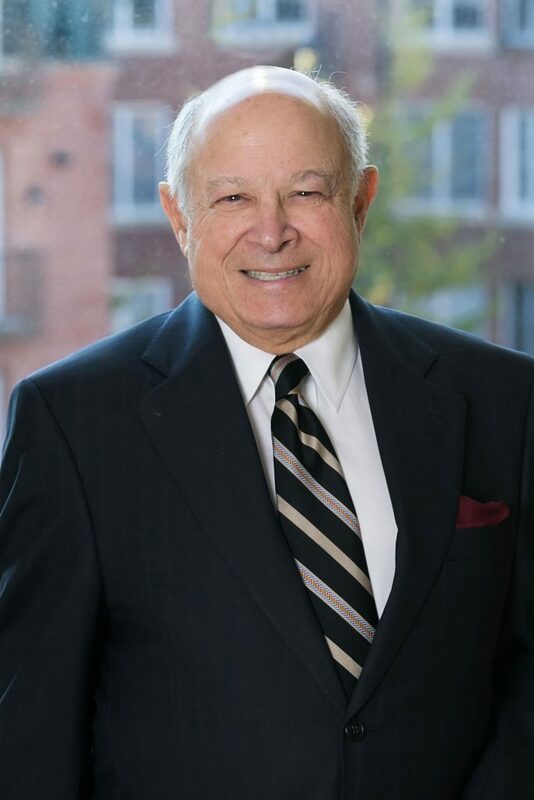 Through his nearly fifty years of legal practice, Mr. Stern has advised clients on various business matters including entity formation, purchase and sale of business assets, employee and creditor issues, buy-sell agreements and generational transfers. Mr. Stern provides strategic counseling for individuals and organizations in the areas of estate planning and administration, charitable giving and business continuity planning to maximize assets and meet other family and organizational objectives while reducing tax liability. He advises clients to ensure the proper disposition of assets in accordance with client’s objectives while employing tax planning techniques such as the use of irrevocable and revocable trusts, life insurance planning, lifetime gifts and charitable trusts. Mr. Stern advises clients in matters related to zoning, land use and real estate tax assessment law, as well as matters involving municipal law and regulations. He practices regularly before city and county administrative agencies and advisory boards concerned with matters of land use, zoning, and building permits and alcoholic beverage laws. He provides counsel on conditional approvals, variances and other like matters to clients in diverse industries, including residential developments, religious institutions, daycare centers, restaurants, telecommunications, shopping centers and convenience stores. Mr. Stern has been a leader in professional organizations for two decades. In 1976, he (along with others) founded the Maryland Institute of Continuing Professional Education for Lawyers (MICPEL), which became the largest provider for continuing legal education in MD for over 34 years. Mr. Stern led the organization through the first fifteen as its President, Vice President, Secretary or member of the Board of Trustees. He has as served as President of the Maryland State Bar Association (MSBA), member and Chair of the Board of the Frederick Community College, Vice Chair and Board Member of Frederick Memorial Health Care Systems and Chair of the United States Magistrate Judge Selection Panel. A Life Fellow of the Maryland Bar Foundation and the American Bar Foundation, Mr. Stern currently is a member of the Estate and Trusts Section, Real Property and Zoning Section of the Maryland Bar Association. Mr. Stern maintains the highest possible rating (AV) from Martindale-Hubble. Before joining Offit Kurman, Mr. Stern was a partner in a number of local and regional law firms, the most recent being Seymour B. Stern & Associates P.A., a firm which he founded for general practice serving individuals, families and entities with estate, business, family and real estate needs. "Offit Kurman Attorney Seymour Stern Voted Best Lawyer in Frederick County"
Readers of Frederick Magazine recently voted Offit Kurman attorney Seymour Stern the best lawyer in Frederick County, Maryland. Mr. Stern appears in the “Best of Frederick 2019” list in the magazine’s February issue. "Seymour Stern Celebrates 55 Years in Business and Real Estate Law"